Kilting from... the other side of the mirror? 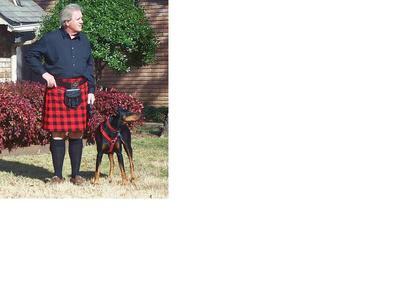 All black kilt and Black watch tartan shirt. About a year ago I bought my first kilt, and I owned it (the first one) for about 8 months before I wore it out in public to an event. That was first day was Thanksgiving day of 2012. Since then (and about 4 months ago), I've worn a kilt out and about 7 times. Each time it was more fun than the time before. Last Friday I went to dinner in the hip part of old Tulsa, and chose to wear pants instead of one of my kilts.....Just thought that I'd spare my friends of having to be with "the kilt guy".....Again. Well.....guess what? As we were eating dinner a gentleman and his wife showed up at the restaurant and you know what? He was wearing a tartan kilt with a blue blazer, white shirt and tie. It was interesting, and of course I had to point out to my friends that I wasn't the only guy in town willing to wear a kilt. 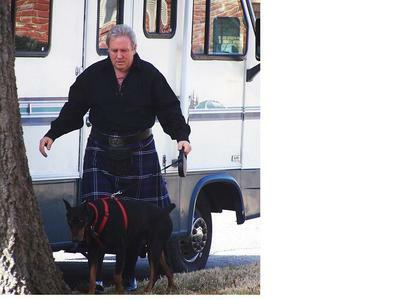 Yes he was kilted, and he wasn't a Mel Gibson, but then neither am I. He was about 5'8", #250, and around 28-35 yrs old. He had a shaved head, with a rather thin beard, and (might I add) looked great in his kilt. Being a (new) "kiltie" myself, after we ate, I went over and talked to him a while. I complementing him on his attire, and asked him about his kilt wearing. 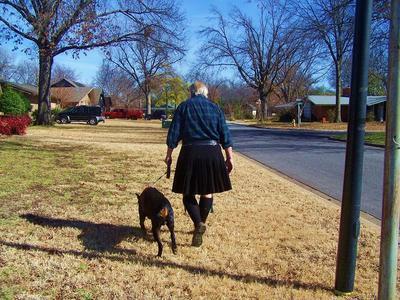 I found out that he's a college professor, and in addition to wearing a kilt to special nights out with his wife, he also liked to wear a kilt every now and then when he was teaching at the University. I was seated for dinner, for entertainment I'd been watching the new diners come to the hostess lectern confirming their reservations as they arrived at the restaurant. Because of my vantage point I had noticed the kilted gentleman when he had first entered the restaurant, and I took the opportunity to watch the crowds reaction to a person in a kilt from.... the other side of the glass. My first observations was that he seemed a little nervous. I knew that moment, because I'd been there too. What was interesting was that his (apparent) apprehension seemed to be totally out of place and competently unwarranted. As I watched the crowd, I came to the conclusion that if he had "strutted" to his seat in the bar (like a highlander) it would have not only been appropriate, but it was almost like the other diners were expecting him to. So, my conclusion drawn from the situation was this. It seems that when you actually MAKE IT TO THE BAR in your kilt all apprehension should be gone. Why? Because by the time you've dressed, and driven to the rendezvous point, any hard work was done, and as you enter the establishment the crowd EXPECTS you (really any man in a kilt) to be walking tall, and proud.